In their second performance together, TamikoThiel and the U|D|K twisted the rules of perception to create spatial and visual dislocations in the space-time fabric of Second Life. 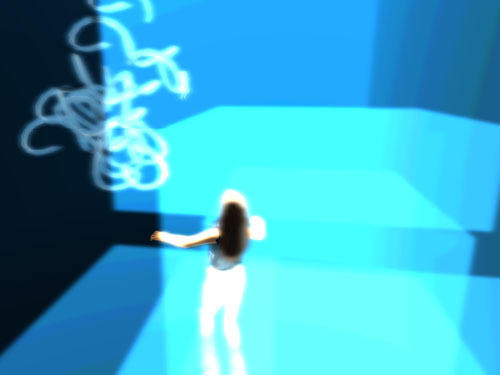 "Perceptive Dislocations" can be experienced at the Goethe-Institute Island in Second Life! Please go to the Goethe-Institut "Dislocations" website and press the orange "Teleport zur Goethe-Insel" button - if you don't have it already, you will be asked to download and install Second Life. When you get to the Goethe-Insel, the red & black couch should be waiting for you - click on it for the ride of your life! For documentation of the performance please see this slide show from the good folks at Bokowsky+Laymann - a machinima video documentation is under construction. This is a demo machinima of "Dislocative Sculpture," a performative sculpture created by Tamiko Thiel, Goethe-Institut Artist in Residence in Second Life, and the United Dislokations Kartell (U|D|K), a group of independent artists evolving out of the Berlin University of the Arts and dedicated to disrupting the virtual order of things. We began with the remnants of Franco and Eva Mattes' previous work, "7000 Oaks." Many thanks to Franco and Eva for allowing us to dislocate their sculpture! Using the peculiar physics of building in Second Life we created a sculpture by dislocating "7000 Oaks" and various other objects that we collected for free in Second Life. The music is from "Parallel Lines" by Morton Subotnick, courtesy of Archive.org. Constantin Engelmann: music research, 2nd life physics research (exploding Porsches), Porsche & containment scaling, realtime platform manipulation & dislocation. Idan Sher: music research, rotating sculptures, realtime platform manipulation & dislocation. Felix Worseck: scripting, realtime AiR-Box platform permutations and dislocations, damage control containment. Melanie Bossert: audience seating, scripting, realtime AiR-Box platform permutations and dislocations, damage control containment. by Tamiko Thiel and the United|Dislokations|Kartell. Cyberspace: The Final Frontier. Since 1994 online virtual 3D worlds have promised us endless freedom to be and do and create whatever we want, free of all restrictions. The most successful virtual online world so far, Second Life, promises us a newer and better virtual life, where we can live out our fantasies of who we want to be and what we want to do. As with all gated communities, however, membership comes with a stern set of rules regulating what can and cannot be done where and when and by whom. 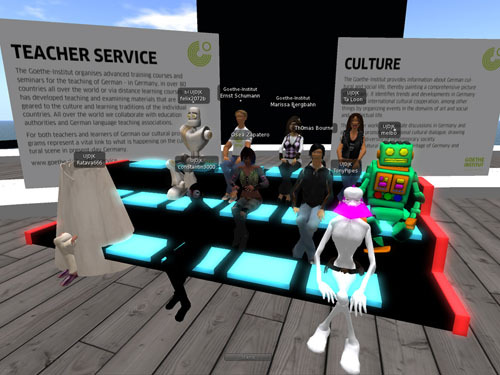 During her tenure as Goethe-Institut Second Life artist in residence Tamiko Thiel staged two performative events that explored the boundaries of what can and cannot be done in Second Life. Many thanks to the Goethe-Institut for this wonderful opportunity, and to Bokowsky+Laymann for the magnificent technical support!